So I am in Beijing and thought I was going to be able to avoid the shark-finning issue...I almost did. 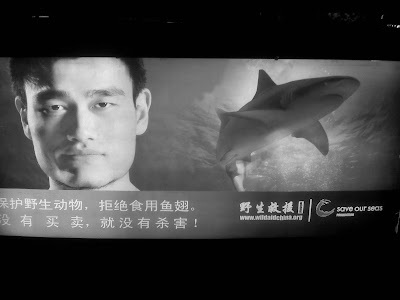 At first I was pleasantly surprised as I came across a large billboard of Yao Ming and a shark - said that if you stop buying, you stop the killing. Ironically this was on the way to the restaurant I was going to eat some Peking duck at. 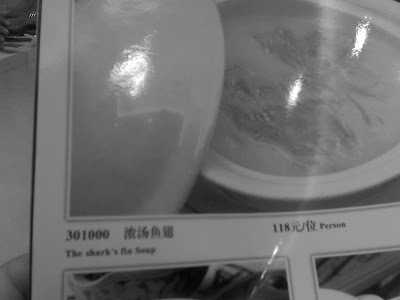 Flipping through the menu I came across, what else, some shark fin soup... I was thinking about leaving, but honestly did not think I was going to find a typical Chinese establishment that does not serve fins.